Author(s): Antimo Gioiello, Bruno Cerra, Serena Mostarda, Chiara Guercini, Roberto Pellicciari, Antonio Macchiarulo. Department of Pharmaceutical Sciences, University of Perugia, Via del Liceo 1, I-06122 Perugia, Italy. Bile acids are a peculiar class of steroidal compounds that never cease to amaze. From being simple detergents with a primary role in aiding the absorption of fats and fat-soluble vitamins, bile acids are now widely considered as crucial hormones endowed with genomic and non-genomic functions that are mediated by their interaction with several proteins including the nuclear receptor Farnesoid X Receptor (FXR). Taking advantages of the peculiar properties of bile acids in interacting with the FXR receptor, several biliary derivatives have been synthesized and tested as FXR ligands. The availability of these compounds has contributed to characterize the receptor from a structural, patho-physiological and therapeutic standpoint. Among these, obeticholic acid is a first-in-class FXR agonist that is demonstrating hepatoprotective effects upon FXR activation in patients with liver diseases such as primary biliary cirrhosis and nonalcoholic steatohepatitis. This review provides an historical overview of the rationale behind the discovery of obeticholic acid and chemical tools generated to depict the molecular features and bio-pharmacological relevance of the FXR receptor, as well as to summarize structure-activity relationships of bile acid-based FXR ligands so far reported. Keywords: Bile acids, Farnesoid X receptor, Structure-activity relationships, Structure-property relationships, TGR5. Affiliation:Department of Pharmaceutical Sciences, University of Perugia, Via del Liceo 1, I-06122 Perugia, Italy. Keywords:Bile acids, Farnesoid X receptor, Structure-activity relationships, Structure-property relationships, TGR5. Abstract:Bile acids are a peculiar class of steroidal compounds that never cease to amaze. From being simple detergents with a primary role in aiding the absorption of fats and fat-soluble vitamins, bile acids are now widely considered as crucial hormones endowed with genomic and non-genomic functions that are mediated by their interaction with several proteins including the nuclear receptor Farnesoid X Receptor (FXR). 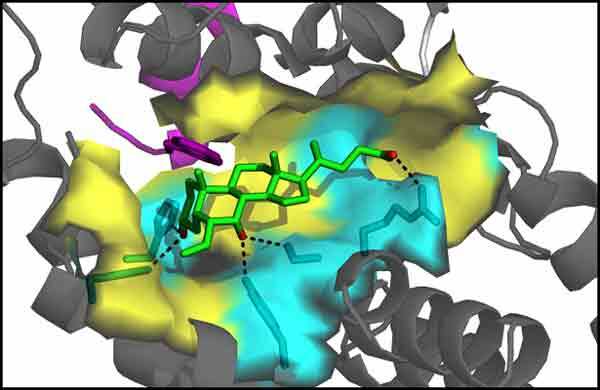 Taking advantages of the peculiar properties of bile acids in interacting with the FXR receptor, several biliary derivatives have been synthesized and tested as FXR ligands. The availability of these compounds has contributed to characterize the receptor from a structural, patho-physiological and therapeutic standpoint. Among these, obeticholic acid is a first-in-class FXR agonist that is demonstrating hepatoprotective effects upon FXR activation in patients with liver diseases such as primary biliary cirrhosis and nonalcoholic steatohepatitis. This review provides an historical overview of the rationale behind the discovery of obeticholic acid and chemical tools generated to depict the molecular features and bio-pharmacological relevance of the FXR receptor, as well as to summarize structure-activity relationships of bile acid-based FXR ligands so far reported.